But, in the kitchen, dehydration can be a lot of fun. My Snackmaster Dehydrator tells me so. And yesterday, this $5 yard-sale beauty made some wonderful apple snacks for us! I had several apples staring at me from the kitchen table, and a lot of time on my hands, so with just a few apples and a couple of knives, I filled up the machine, set it to the fruit/veggies setting, sprinkled just the right amount of cinnamon, and wa-la! snacking for days to come. I look forward to trying bananas and maybe even some vegetables to see what we can come up with. The wafting of cinnamon apples and the whir of the machine was enough to transport me back to my mother's kitchen....why don't you give it a try? Hope Paul is feeling better. Keep praying...the heat is getting to us! 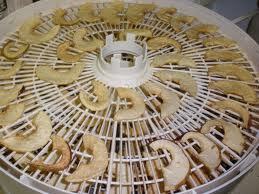 But the dehydrated apples are still de-lish!